Let's start with some terminology. When I'm talking about an account, I refer to what most people call a wallet. An account is active on the XRP ledger when activated by depositing the account reserve (currently 20 XRP) or more to an account address. When I'm talking about a wallet, I refer to software that may or may not run on a piece of specialized hardware. This can be Toast Wallet, a Ledger Nano or even a piece of code you wrote to sign transactions and send them to the XRP ledger. I'll refer to your rXXXXXXXXXX... code as your account address. While most people call their sXXXXXXXXXX... code their secret, this string is actually called your family seed. I will explain the difference in the second half of this blog. A transaction to be submitted to the XRP ledger is a JSON object. JSON is an open-standard file format that uses human-readable text to transmit data objects. A transaction can be a Payment, to send XRP from one account to another. There are other transaction types on the XRP ledger as well, like transactions to modify account settings, offers (decentralized exchange), escrows, etc. This transaction can be sent to a rippled node. This rippled node will then distribute the transaction to the network. Validators will vote and if the transaction is OK, it will be added to the next block on the blockchain. Your XRP moved from your account to the happy recipient. How did all the rippled servers and validators know the transaction was really yours to make? Couldn't you have put any account address in the transaction? Because you need to sign the transaction, and submit the signed transaction to a rippled node. Signing your transaction means you'll have to prove you are allowed to spend funds for the account sending the transaction. That's what your secret or mnemonic is for. I will discuss this later. Signing is like putting your signature under a letter and putting a stamp on a document, proving the document is official and actually came from you. With one big difference. Your signature contains a blueprint of the document you are putting it under. Your signature is reflecting the document contents, while still being demonstrably and verifiable yours. The mind-boggling thing about the cryptography used is that the entire process is one way: everyone can verify the signature is yours and the signature is matching the document contents, without exposing the way signature should be for other document contents! To create generate your signature for a specific transaction, your hexadecimal private key will be used. The generated signature and the matching hexadecimal public key will be added to your transaction contents. Your key pair really is a pair: they cryptographically belong together. 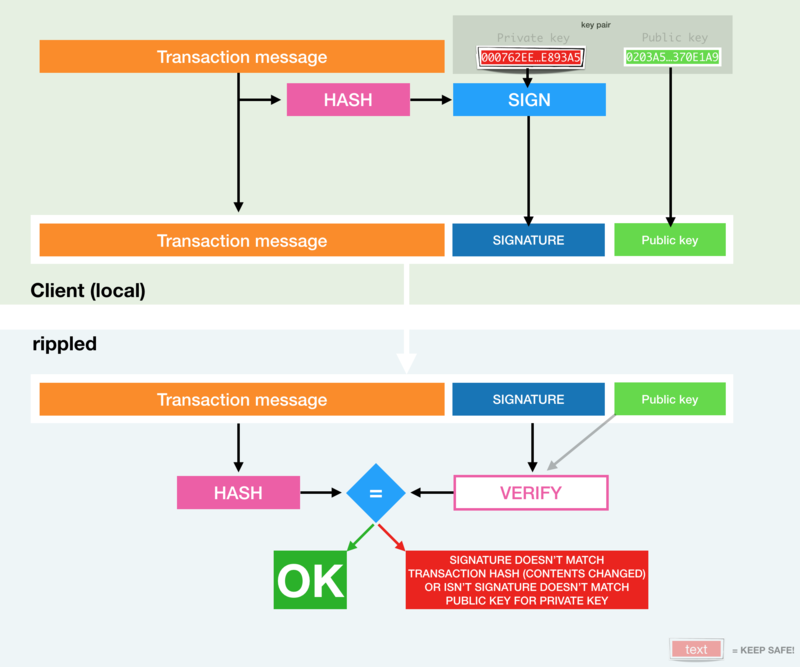 The public key can be derived from the private key and it can be cryptographically verified if a signature is signed using the private key matching a given public key. You probably don't know your own key pair. At least: not directly. Indirectly you do: your hexadecimal private key is derived from the secret you do know, and your account address (the rXXXXXXXXX... string) is derived from your hexadecimal public key. Now everyone can check if your transaction is valid. Your signature can be verified by checking if the signature actually matches the transaction and the public key. There are two types of secret information people use to "own their account". Most wallet software uses the sXXXXXXXXXX... one, called the family seed. A few (like the Ledger Nano) use a list of words, called a mnemonic. (There is a third, less secure method: a plain passphrase). The most important thing to realize when you look at the image displayed above is the fact that everything is one way. 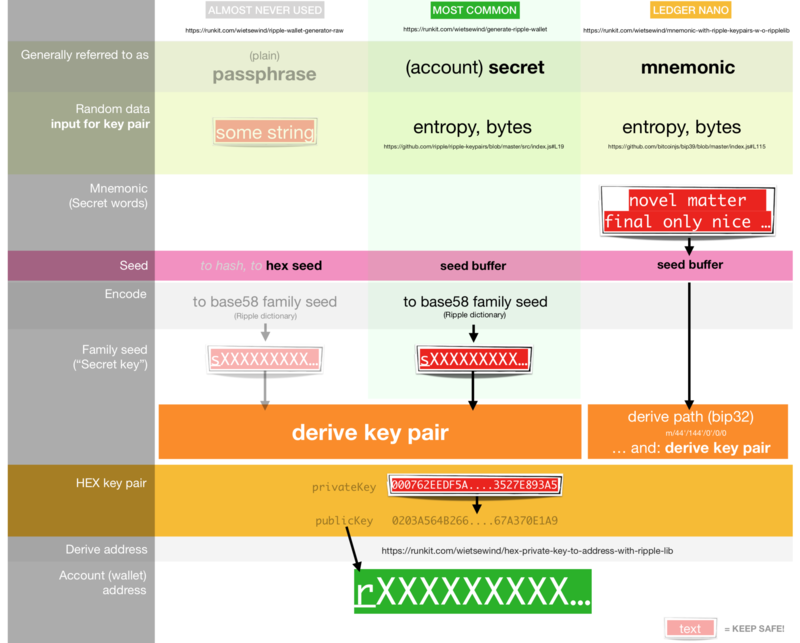 The key pair can be derived from a family seed or mnemonic, but you can't go back. Your public key can be derived from your private key, but not the other way around. The only way back is to verify if a public key and signature are actually a valid result of the private key.